A blazing west coast heat wave is expected to send the mercury soaring as high as 130 degrees in the California desert . The heat threatens to ground airliners and has cities here in the Bay Area setting up cooling stations. Friday's heat was so punishing that rangers took up positions at trailheads at Lake Mead in Nevada to persuade people not to hike. Zookeepers in Phoenix hosed down the elephants and fed tigers frozen fish snacks. The extreme heat forced Amtrak to abide by speed restrictions here in the Bay Area. Trains have to slow down and delays are expected. 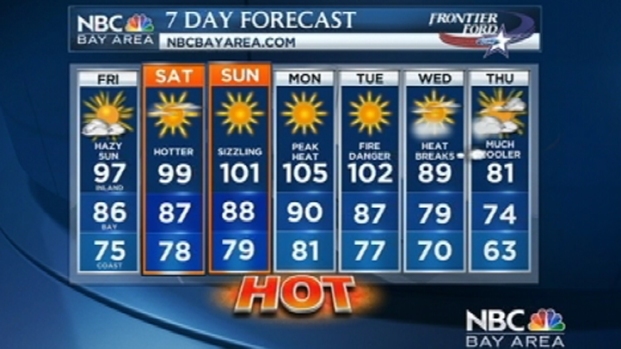 MORE: Bay Area cooling centers open this weekend. The thermometer in California's Death Valley read 121 Friday with the mercury expected to reach 130 through the weekend. That is just short of the 134-degree reading from a century ago that stands as the highest temperature ever recorded on Earth. It won't get that hot here in the Bay Area, but triple digits are possible. Much of the Bay Area is under an excessive heat warning which is expected to last through Tuesday. Right now, a strong ridge of high pressure is bringing much warmer and drier air aloft which will lead to warmer temperatures with each passing day. Christina Loren tells us just how hot it is going to get this weekend, with even hotter temps forecast for Monday. SATURDAY: Today an Excessive Heat Warning goes into effect and continues into Tuesday. Today temps will start near 60° with clear skies. Temps will soar today under sunny skies. Inland locations will top out from 95 - 105, Bayside mid to upper 80s, & at the Coast 78 - 88. SUNDAY: A clear start to the day with temps from the 60s to near 70. Another hot day is on the way with Inland locations reaching 97 - 107. Bayside near 90, & at the Coast from 80 - 90. MONDAY: Another very hot day is expected today with Inland areas reaching 100 - 110. Bayside temps will warm to near 90, & at the Coast from 80 - 90. 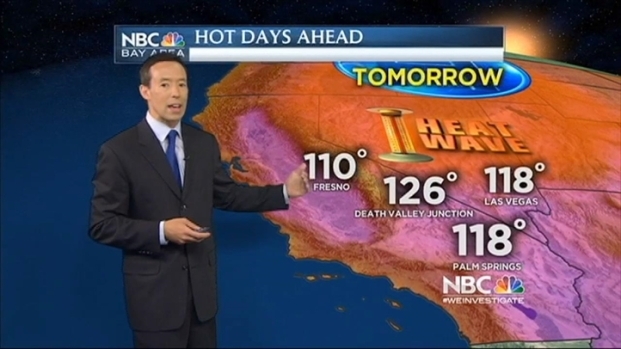 TUESDAY: Temps will be very hot again today with Inland locations reaching 97 - 107. Bayside temps will be near 90 & at the Coast 75 - 85. AHEAD: The heatwave is expected to break Wednesday with temps backing off into the mid to upper 90s and eventually into the 80s for the 4th of July. Temps will be more tolerable by late week. Experts warned people to stay out of the sun, wear broad-brimmed hats outdoors, drink lots of water and avoid putting pets and children in parked cars where the temperature can quickly soar. Drivers who might find themselves stuck in a hot car should carry extra sunglasses, water, snacks and any prescription medications they may need.